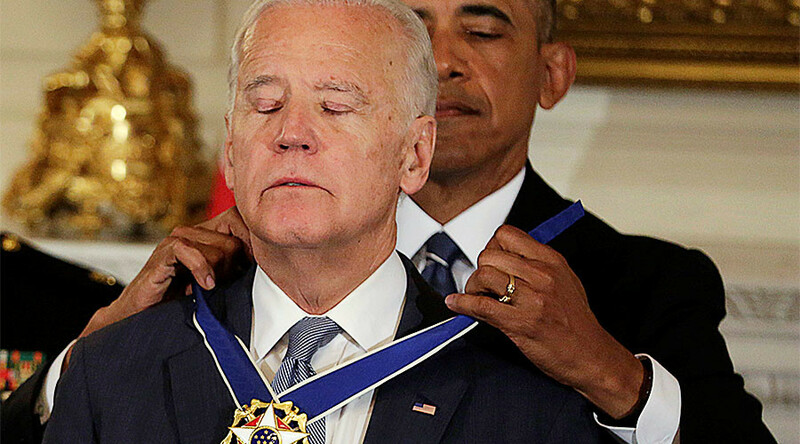 Joe Biden won a place in the heart of the mainstream media when President Barack Obama awarded him the Presidential Medal of Freedom, the highest civilian award in the US, previously given to dignitaries including Margaret Thatcher and Tony Blair. The vice-president, overcome with emotion when Obama made the surprise announcement, turned to the White House mantlepiece in an attempt to hide his tears. The moment left the MSM with a warm fuzzy feeling for Biden. “To know Joe Biden is to know love without pretense, service without self-regard, and to live life fully," Obama said of Biden at a ceremony that could have easily been mistaken for a best man's speech at a wedding. Obama and Biden’s “bromance” saw them enjoy an eight-year term in office in which the president earned the nickname “The Drone King” as he oversaw 10 times more strikes than George W. Bush managed throughout his time in the Oval office. Biden, who played a key role in authorizing the invasion of Iraq in 2003, is sure to benefit from Obama’s words if he becomes a presidential candidate in 2020, a move at which he has hinted. He previously ran for president in 1987 but dropped out of the race after allegations that he plagiarized a speech by leader of the British Labour Party, Neil Kinnock. He had planned to run in 2016 but didn’t contest after the death of his son Beau from brain cancer. Biden’s contribution to the war in Iraq was highlighted by UN weapons inspector Scott Ritter, who in 2002 criticized a hearing Biden held that would pave the way for the invasion. “Sen. Joe Biden is running a sham hearing. It is clear that Biden and most of the Congressional leadership have pre-ordained a conclusion that seeks to remove Saddam Hussein from power regardless of the facts, and are using these hearings to provide political cover for a massive military attack on Iraq.” Ritter said.